By Melissa 10 Comments - The content of this website often contains affiliate links and I may be compensated if you buy through those links (at no cost to you!). Learn more about how we make money. Last edited May 27, 2014 . For years, my favorite part of relaxing on Saturday night was watching Suze Orman followed by ‘Til Debt Do Us Part. I soaked up Suze's words and tried to guess how she would respond to callers' questions. I also listened to Dave Ramsey and subscribed to his principles. But slowly, my faith in these financial gurus began to waiver. The discontent began slowly. My husband and I, inspired by Dave Ramsey, became gazelle intense when we tried to pay down our debt. But after several months of gazelle intensity, I watched our family life unravel. Thanks to all the extra work I took on, I found myself sleep deprived and short tempered with our youngest children, who were then only 1.5 and 3 years old. I still regret that I pushed myself so hard when my children needed me so much back then. My husband and I decided that while a gazelle intense push is great, it's hard to sustain for the amount of time it takes to pay of tens of thousands of dollars of debt as we are. Of course, because we were Ramsey followers, we had our $1,000 emergency fund. All other money went to debt. And the decision to only save $1,000 put us in a tight position several times. My husband often pays out of pocket to attend professional conferences, and then he's reimbursed 6 to 10 weeks later. Frequently, his expenses are more than $1,000 especially when he has to fly to the conference, so our emergency fund is wiped out until we're reimbursed. I'm a freelancer, and we had a few months where I suddenly lost jobs or didn't have as much work as I thought I would and again, $1,000 wasn't enough. We ultimately decided our minimum comfortable emergency fund was $3,000. Blanket advice by financial gurus can be a good starting place, but ultimately you have to do what you're comfortable with. Another popular piece of financial advice is that you shouldn't buy a home until you have a 20% down payment and a hefty emergency fund. Where some people live, you can get a very nice house for $150,000. While $30,000 to save for a down payment is a good chunk of change, saving that amount over a few years is possible. What about someone who lives in an area where starter homes run $400,000? How long will it take to save an $80,000 down payment? Certainly more than it takes the person who is saving for a $30,000 down payment. To make it worse, people who live in high cost of living areas often have to pay a high price for rent, making saving for such a huge down payment even more difficult. 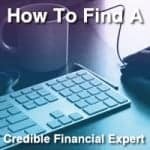 My husband and I searched for over two years to find a financial advisor we liked and trusted. 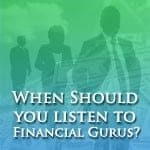 When we interviewed Sean, the financial advisor we finally hired, we were shocked when he went against the advice of financial gurus and other financial advisors we had interviewed and suggested that when I rolled over my IRA, I should take some money out to pay off our credit card debt. He assured us that the tax burden wouldn't be as bad as we thought, and he also showed us that by paying off the debt, we'd have more cash flow every month to meet our financial goals and regularly contribute to our retirement. He was right, too. Am I suggesting everyone take money out of their IRA to pay off some debt? Absolutely not. 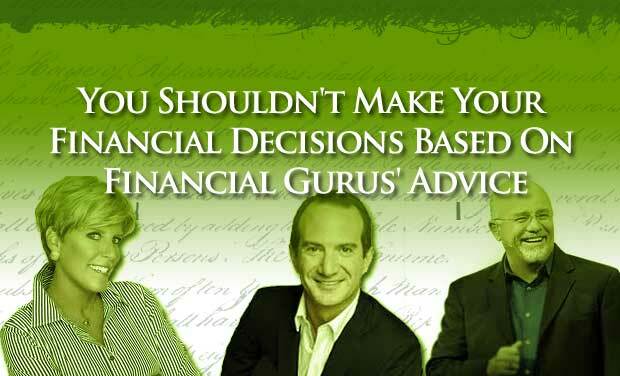 However, I am suggesting that you not take financial gurus' advice as a one-size-fits all approach to your finances. While their advice is a good place to start, you have to financially do what is best for you and your family as well as your unique situation. If you're not comfortable making these decision on your own, find a financial advisor who will consider your situation and advise you based on that, rather than conventional wisdom. Do you remain true to popular financial gurus, or do you see their advice as a springboard for your own actions? There just isn’t a substitute for good common sense. Do what works for your famiy. I am an income tax person myself and I usually don’t favor taking money out of 401k if there is a penalty involved. But, with everything in life , there are exceptions. If, your advisor was aware of your tax situation at the time ( and by the way that is a BIG but) then that may have been a time to make an exception. I agree that your personal situation should definitely inform the decisions that you’re making for your family. I think some of the gurus’ advice should be used mainly as a starting point, and tailored to suit your family’s needs. Like you we decided while doing the Dave Ramsey program to use a larger emergency fund – $3000 in our case. We also did things a bit differently in other areas of the program as well, like investing. In any event, take what you can glean from the gurus, and tailor it to fit your needs! I dont trust anyone on TV really. Seems they are all paid shills to pitch products that they get paid to endorse in the form of staged real discussions. There is a lot of noise these days for investors and its hard to sift through the crap of misinformation. Don’t even get me started on financial advisers. I rather make my own mistake in an investment and learn from it rather than a so called financial adviser making mistakes on my behalf while collecting his commission. They defiantly have their place but I think money coaches are a better route and also fee based unbiased advisers. Stay far away from advisers at the big banks! Definitely springboard. For example, love Gail Vaz-Oxlade’s books and shows, but she subscribes to the cash only philosophy that doesn’t work for us. We prefer to get cash rewards on credit cards, plus the tracking of cash when I rarely use it is a nightmare. Much easier when all charges come through on card and can be downloaded. I look at charges (almost) daily though. This is an important consideration to be sure you are staying on budget. I think I’m a better money manager this way than if I used cash and jars/envelopes. I love Travis’ response, please sit down and work your own budget based on your income and your real life circumstances. Balance it out…. I think you can pull generalities from many of them, but you have to make it fit to your given situation. I believe most of them have good intentions, though it’s so difficult to apply everything they say as each of our situations are going to be different. I absolutely agree with the points you make in your article. The “gurus” out there may be a good start for the masses, but you’ve got to adapt their advice to what works for you in real life. I’ve got an old 457 account that I can no longer contribute to (and haven’t been able to for years) so once our mortgage is down to $50K, I’m taking a $50K loan against it and paying our mortgage off in full. I really don’t care about the loss of the compound interest – it’s not that much once you run the numbers and it is well worth it to us to have our mortgage paid for in full in the next few months before the market “corrects” again – tic toc! Totally agree – great article. We started FPU when we desperately needed a plan. Once we were out of crisis mode we realized that systematic savings had to be part of our plan, even though we were on baby step 2, because we are both spenders. It took the better part of four years to be able to hold the $1000 emergency fund but now we save for a number of things, including a small Roth IRA. We also decided that gazelle intense long term wasn’t going to work for us with a young child. We want to be with her while we have her. They are grown and gone so quickly. So we push in spurts to get to the finish line of a debt and then reward ourselves. This month we’ll be down to 1 student loan and I don’t regret our journey being longer. I would regret lost time with our daughter. We take a lot of advice from Suze Orman as well as Dave Ramsey. We do a compilation of the two methods and try to figure out what works for us best.